“It’s an attention grabber,” said Adam Mellenkamp, ServoStop product manager for Stober. “Everyone we show it to may not be able to use it right now, but can think of a situation where they could have used it in the past. It was originally designed for a safety application where you need redundant braking. 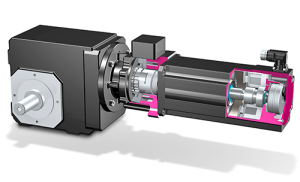 ServoStop can be mounted on almost all common servomotors, giving it endless applications in factories universally, and is an integral part of STOBER’s ServoFit gear reducers. It has a plug-in coupling for simple motor removal, no matter what position the braked axis is in, and prevents gravity-affected axes from sinking or crashing. Providing safe braking can be difficult as well as dangerous, especially when machinery incorporates vertical axes– which is common in material handling for robotics or machine tools industries. Advantages of the ServoStop are that it is easy to remove motors, even with load; it is backlash-free and smooth-running; it offers frictional shaft to hub for high torque; and provides a compact design for low inertia.